For all of the ways I struggle with the temptation to spend too much time using my smart phone, one of the things I absolutely love about my phone is how it helps me read more books. My reading habits have changed dramatically the past few years because of how easy my phone makes it to listen to audiobooks. I set a super attainable reading goal each year of getting through 12 books. But until a few years ago, I rarely made it, simply because I find it difficult to find the time to sit down and read. For the past two years, I’ve switched my reading to about 95 percent audiobooks. I easily fly through one book a month, and often I “read” more than that. I love listening to audiobooks when I’m in the car. I also pop in my headphones when I walk to keep my brain moving along with my body. But one of my favorite things about audiobooks is how I can use them to motivate me to do other things. I often listen to a book while I’m folding laundry, loading the dishwasher or cleaning the house. Pairing the fun of listening to a book with a task I don’t necessarily love gives me added motivation to get things done. So far this year, I’ve listened to 13 audiobooks. Before I get into the details of the books I’ve read, I will explain the reading apps that I use. My main audiobook app is Audible, which is owned by Amazon. With my monthly subscription, which is $15 a month, I am able to download one book per month. Audible often offers special deals on extra credits for books, or I can pay full price to download a book (which I rarely do). At first, I wasn’t sure Audible would actually be worth the price. But the thing I love about it is that I can get newly released books immediately before they are available through the library. I also don’t have to wait for books that are already checked out (as I will explain with my next two reading apps). Another benefit of Audible is that once I purchase a book, it’s mine. I have gone back many times to reference a book I read previously, which is something I can’t do if I use one of the other two apps I’m about to mention. This is the app that is used by many libraries to offer ebooks and audiobooks. I love the fact that I can check out a book from the library while we’re on vacation or driving in the car, download it and begin listening immediately. The downsides are: 1. They don’t have the selection that I can find on Audible, 2. I often have to wait for someone else to finish the book I want to download. A few months ago, I found an audiobook I wanted by searching my local library’s collection. But when I went into Overdrive to download it, I couldn’t find it. After much confusion and frustration, I actually had to walk into the library and talk to a real, breathing human being to unravel this mystery. Even the librarian was confused at first. But working together, we both finally discovered Hoopla. This is another app, similar to Overdrive, that is connected to your local library. Hoopla often has books that aren’t available on Overdrive. I’ve also found that if Hoopla has a book I want, it usually seems to be available. I’m guessing that (like me), not as many people know about it, so it’s easier to find a book there. When I hear about a book I want to read, I usually look on Overdrive, then Hoopla. If I can’t find it there, I go to Audible and wait until I have a credit available so I can download it. I always think it’s fun to look back at my book list from the year because it often tells a story of my personal journey during the past 12 months. Believe it or not, I actually don’t love Jen Hatmaker’s writing style, but I did love the premise of this book. This book helped inspire me to do the monthly challenges I have taken on this year to live more intentionally. I read this after I finished Whole 30 in January and as I was starting the AIP diet in February. It was like a friend encouraging me that I could do what I needed to do. I’ve also started listening to his podcast this year. He gives great stories about people who have created successful “side hustles” to pursue their dreams and make extra income. I love learning about different views on how to eat better. I’m a huge follower of Robb Wolf, who is kind of the spokesperson for the Paleo diet. This book helped me gain a better understanding of insulin resistance and inspired me to do the seven-day carb test. After talking to my doctor about what I had learned, she did some tests, and I found out I’m hypoglycemic. Knowing this has helped me eat smarter to keep my energy level more stable throughout the day. This is a great book that I read for my job. It is helpful to identify your strengths and weaknesses in leadership. Powerful autobiography by a neurosurgeon who was diganosed with an aggressive form of cancer at a young age. I loved this book. It will inspire you to throw stuff away and refold all of your socks! Just read it. My health was obviously a big theme this year. The only fiction book I’ve read this year or in a few years. It was totally worth the read. I’m actually only a few chapters into this one. It was recommended to me by several different people, so I’m looking forward to gaining some new insights on creativity. Ohhh… I’ve actually read one book with my eyes this year, too! So, tell me about your reading habits. 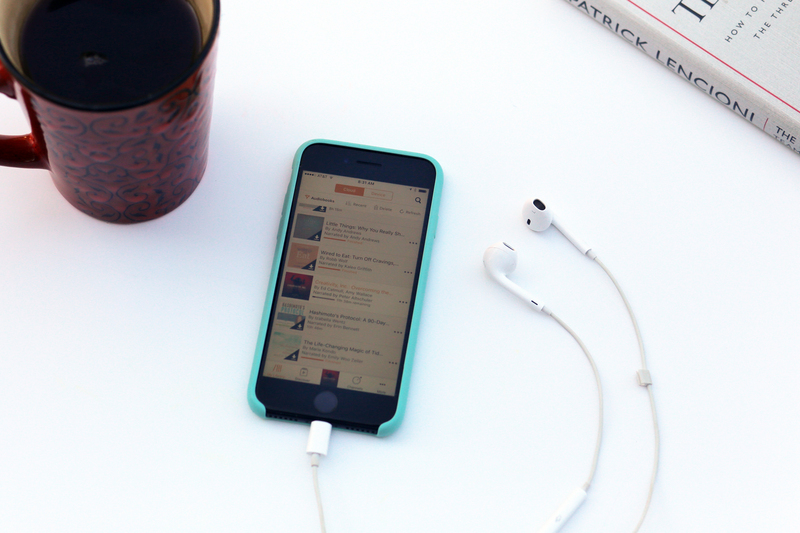 Do you love audiobooks? Or do you stick to actually reading? What’s your favorite reading app? What are some of your favorite books this year?